Hello again! It’s me, Natalie, back with a nice and easy Christmas Card, featuring stamps from the Sentimentally Christmas set and the Christmas Hugs stamps set. I love how you can mix and match Mama Makes’ stamps to create some truly unique cards. 1. 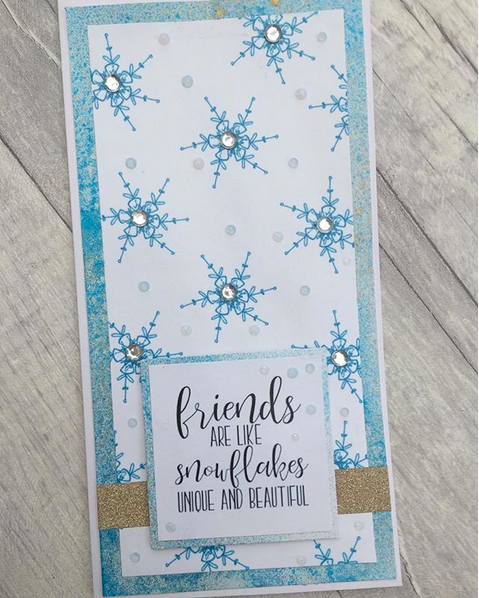 Using blue ink, randomly stamp the snowflake from the Christmas Hugs stamp set all over your white card. 2. Once the ink is dry, trim the paper down to approximately 3.5”x7.5”. 3. Using black ink, stamp the sentiment from the Sentimentally Christmas set onto a small piece of white card. 4. Once the ink is dry, trim the paper down to the desired size. 5. Mount these two pieces onto the blue and gold background paper and trim them down to the desired size. I created my background paper using Nuvo Mica mists, but you can use any paper you like. 6. Stick a piece of the gold glitter tape across the whole width of the snowflake panel, wrapping it around the back to give neat edges. 7. Mount the snowflake panel onto the card blank. 8. Using double-sided foam tape, mount your sentiment piece onto the front of the card as shown. 9. To finish off the card, add a silver craft gem to the center of each snowflake and dot the Nuvo drops around as desired. Leave to dry. And that’s it. Simple, but striking.